The U.S. Department of Labor has made clear that enforcement of federal wage and hour laws is a top priority. Its Wage and Hour Division reported that it closed nearly 146,000 cases from 2009 to 2013 and collected more than a billion dollars in wages for more than 1.2 million workers. 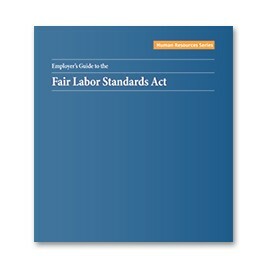 Employer's Guide to the Fair Labor Standards Act is a complete resource for businesses like yours that need to know how to stay in compliance with the FLSA and its regulations. The Guide shows you exactly how these regs apply to your daily operations. It also explains the steps to take when a problem occurs. The Employer's Guide to the Fair Labor Standards Act is the authoritative resource — specifically for private-sector organizations — that helps ensure compliance with the FLSA. You get comprehensive, practical guidance, original reference documents and timely reporting that help maximize your success in dealing with the full range of FLSA requirements. Daniel B. Abrahams is a partner in the Washington, D.C. office of the international law firm, Brown Rudnick LLP. Mr. Abrahams regularly represents employers before the U.S. Department of Labor and in the courts. Mr. Abrahams was an adjunct assistant professor at George Washington University Law School for almost a decade, where he co-taught a course entitled, "Federal Labor Standards" in the Government Contracts Program. He has lectured widely on government contracts and labor standards topics for private groups, the Small Business Administration, Federal Publications Inc., the Educational Services Institute, and the George Washington University Government Contracts Program. He is co-author of Thompson’s Fair Labor Standards Handbook for States, Local Governments and Schools, the Employer’s Guide to the Fair Labor Standards Act, the Public Employer’s Guide to FLSA Employee Classification, and the FLSA Employee Exemption Handbook, and serves on the Editorial Advisory Board for those products. Sandra J. Boyd is the vice president of advocacy and outreach for Achieve, Inc., a bipartisan, non-profit organization that helps states raise academic standards, improve assessments and strengthen accountability to prepare all young people for postsecondary education, work and citizenship. She holds an undergraduate degree from San Diego State University and a juris doctor from the George Washington University Law School. Boyd has served as the vice president of human resources policy at the National Association of Manufacturers in Washington, D.C.; as Assistant General Counsel of the Labor Policy Association and as an attorney at the Washington, D.C., law firm of Epstein, Becker and Green, where she practiced labor and government contract law; and as an adjunct professor at George Washington University, National Law Center. She is co-author of Thompson’s Employer’s Guide to the Fair Labor Standards Act; Fair Labor Standards Handbook for States, Local Governments and Schools; FLSA Employee Exemption Handbook; and Public Employer’s Guide to FLSA Employee Classification. Gilbert J. Ginsburg is an attorney, and counselor-at-law and former partner in the Washington, D.C., law firm of Epstein Becker and Green. He holds an undergraduate degree and juris doctor from the University of Chicago and currently is an adjunct professor at The George Washington University Law School. He is co-author of Thompson’s Fair Labor Standards Handbook for States, Local Governments and Schools; and Employer’s Guide to the Fair Labor Standards Act. Shlomo D. Katz is counsel in the Washington, D.C. office of the international law firm, Brown Rudnick LLP. He holds a B.S. degree from the University of Maryland, School of Architecture, and a juris doctor from the George Washington University Law School. Katz’ areas of specialty include wage and hour, government procurement, and construction law. He advises clients on classification and salary basis issues, participates in wage-hour litigation, and assists clients in developing innovative compensation plans. He lectures regularly on the Fair Labor Standards Act, is a contributing editor to Thompson’s FLSA products and serves on the Editorial Advisory Board for those products. Alfred B. Robinson, Jr. Esq. Jill Schwartz & Associates, P.A.